Damien Hayes tries to wriggle away from Diarmuid O’Sullivan at Semple Stadium. Inset: Despite hitting a staggering 2-12 haul Joe Canning still ended up on the losing side. In scenes reminiscent of All-Ireland Final days, heroes were chaired aloft amid a throng of ecstatic fans after the final whistle had brought an end to a pulsating contest in Thurles on Saturday. How it wasn’t Joe Canning who was receiving the adoration will puzzle Galway hurling fans for some time to come. Instead, it was the evergreen Joe Deane and Ben O’Connor who deservedly received the plaudits from the Rebel Army, a congregation who became their side’s 15th man and willed their team to victory following Donal og Cusack’s sending off in stoppage time of a raucous first half. Canning’s viciously struck penalty gave Galway the lead for the first time in the game, and with wind advantage to come in the second half, surely a victory was now a more than distinct possibility for Ger Loughnane’s side. The intrigue had begun before a ball had been struck in anger. Alan Kerins was drafted into the side as Fergal Moore succumbed to a hamstring injury. The pack rejigged, Damien Joyce was now handed the task of shackling Deane. It was to prove an onerous task as the Killeagh man inspired his colleagues with a dazzling performance. At the other end, Canning had already lashed a goal before Galway registered their first point of the game through Damien Hayes in the 21st minute. Canning’s exploits were masking a malaise in the rest of the Galway attack that would prove fatal. Shane O’Neill and Ronan Curran were hurling impressively for Cork as they restricted the much-vaunted Galway attack to two scores from play in the opening period. Cusack’s dismissal looked to have given Galway the edge, but Cork are a dangerous animal when they have a cause to fight for, and they incredibly managed to notch 15 scores while a man short. All looked to be going to plan in the opening minutes of the second period as Canning pushed the lead out to four, but Galway also wasted opportunities to stretch the lead further. Ollie Canning was cleaning up ball as the spare man, but a failure in distribution gave Cork a glimmer of hope. Deane and O’Connor came to the fore as the Leesiders tore through Galway in a whirlwind five minute spell, culminating in O’Connor’s 49th minute free that amazingly pushed Cork into a lead they wouldn’t relinquish. O’Connor then guided a sideline cut over the bar, to which Canning responded in kind with a monstrous cut from halfway. But unlike Galway, who relied solely on the Herculean efforts of a teenager, O’Connor had able sidekicks in Deane and Cathal Naughton. Deane’s 65th minute point was a gem from out on the sideline with his left hand that pushed the lead out to five. But the mammoth effort had taken its toll and Galway reeled off four points in a flash and extra-time seemed a real possibility. But when the need was greatest, Deane again came up trumps, winning a free which O’Connor duly pointed from a difficult angle to force Galway in search of a goal which never materialised. Cork: D Cusack; S O'Neill, D O'Sullivan, B Murphy; J Gardiner (0-2 ), R Curran, S Ó hAilpín; T Kenny, J O'Connor; P Cronin, N McCarthy (0-1 ), T McCarthy; B O'Connor (0-12 ), J Deane (0-4 ), C Naughton (0-3 ). Subs: P Horgan (0-1 ) for T McCarthy, M Coleman for Naughton, C Naughton for D O'Sullivan. 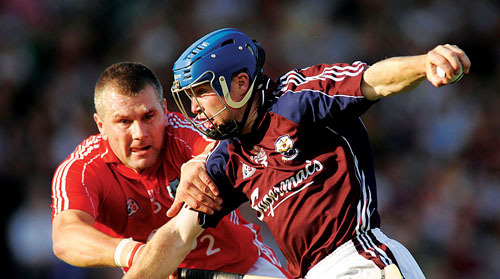 Galway: J Skehill; D Joyce, D Forde, O Canning; S Kavanagh, J Lee, A Cullinane; F Healy, R Murray (0-1 ); I Tannian, K Hayes, A Kerins; D Hayes (0-1 ), J Canning (2-12 ), N Healy (0-1 ). Subs: C Dervan for Joyce, A Smith for K Hayes, A Callinan for Kerins, G Farragher for D Hayes, C Donnellan for F Healy. Referee: Barry Kelly (Westmeath ).